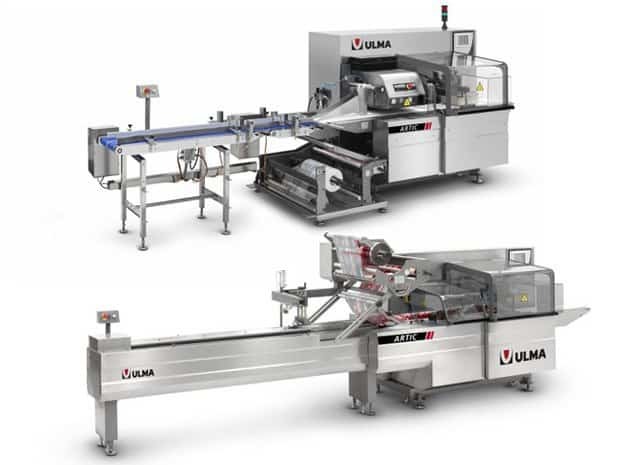 New packaging machine designed to pack fresh food products with modified atmosphere (MAP) for extended shelf life. The system is used to pack products such as fresh or processed meat, poultry, pizza, fish, pasta or cheese in MAP. The shelf life is extended as the product is packed in a hermetically sealed pack with a mixture of protective gases inside it. The new Long Dwell sealing head is characterised by an “oval” motion profile in the jaw, which assures packs with perfectly hermetic seals at high production speeds. This new sealing head, together with the state-of-the-art electronic technology and a food-industry oriented design, turn this ARTIC family into the ideal machine to meet the demands of the food industry. Electronic packaging machine powered with independet motors synchronised by a motion control system. Machine design is specially adapted to make cleaning of machine easy, and to keep the machine in optimum hygienic conditions. Long Dwell cross sealing station specially designed to obtain hermetic seals at high speed when using barrier films. Reel holder with pneumatic fastening system and motorised system for the unwinding of the film. Sanitary version. This version is manufactured with high degree stainless steel materials and it has been designed to avoid dirt accumulation and the sanitary cleaning of the machine. Top Reel and Bottom Reel versions. “On line” residual oxygen analyser with automatic gas flow regulation.